The Justice Resource Center offers many civic and law-related programs to high school students. 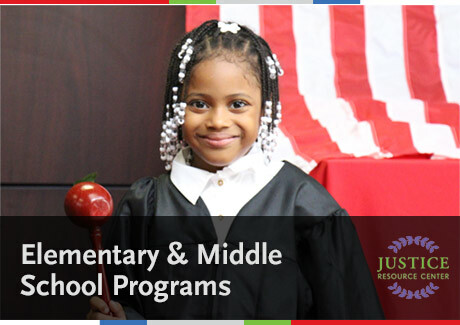 Whether students are building on their knowledge from elementary and middle school or are just discovering the world of law, JRC offers programs that help students become college and career ready. All curriculum materials are aligned with the Common Core standards and some programs equate to college credit. Students develop their potential by engaging in challenging law-related projects whereby they learn research, teamwork and critical thinking skills. Please click to view our High School brochure and price list.